Image result for what is 3d Printer 3D printing, also known as additive manufacturing (AM), refers to processes used to synthesize a three-dimensional object in which successive layers of material are formed under computer control to create an object. The brand new Wanhao Duplicator i3 V2.1 Once again Wanhao leads the way when it comes to high quality and a price that are really attractive! This price is for a pre - assembled printer with a prusa core design. We are excited to present this printer to you and we think it's going to be a real success. The newest edition in the Duplicator family is a huge step forward! This time Wanhao and 3D Prima presents a printer that is good enough to use as a semi professional 3D Printer, but at a price that you can't really believe and that is hard to beat! The i3 comes fully assembled and ready to use. It's based on the open and reliable Prusa i3 design which means that you can grow with the printer, modify it and enjoy it for a long time. The Wanhao i3 comes with a heated build plate, USB connection, SD card reader and a LCD screen. It also boasts with the brand new MK10 extruder – that means that you are free to use almost any filament you prefer, PLA, ABS, PETG, take your pick. Wanhao i3 is built on a sturdy all steel frame design with a metal carriage, this will improve your prints and make sure that you have a printer that sits firmly on your desk without any heavy vibrations that will interfere with the print. This new printer is also equipped with the latest generation of the well appreciated MK10 single extruder and this fact alone is a very good indication of what this printer is able to deliver. A new design feature is that the electronics housing is a standalone part, this fact should greatly decrease almost all electromagnetic interference. We think that this printer can stand up against the best and if you combine this with the incredible pricing you have a printer that is hard to beat – on any level!! Support ABS, PLA, PVA, WOOD and NYLON easy to use. Can be used for printing different items like small components model, decoration etc. Special printing sofware, transfer the STL file to print file. Special frame design for you to see the printing process clearly. Can make true-to-life and high-resolution models and objects. 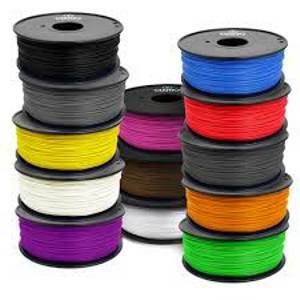 We also stock Wanhao Premium Quality Filaments, ABS and PLA in various colours. Spool Diameter: 16.2cm, Spool Width: 8.5cm and Spool Hub Hole Diameter: 3cm. Ramps is short for reprap Arduino mega pololu shield, it is mainly designed for the purpose of using pololu stepper driven board (similar to 4988 driven board). Ramps can only work when connected to its mother board Mega 2560 and 4988/DRV8825. Owning to its stability in operation and great compatibility with most 3D printer (all reprap-model such as pursa i2 and i3). The combination of Ramps1.4 + MEGA2560 + A4988/DRV8825 is becoming a mainstream of DIY 3D printer control board. The DRV8825 stepper motor driver carrier is a breakout board for TI’s DRV8825 microstepping bipolar stepper motor driver. The DRV8825 features adjustable current limiting, overcurrent and overtemperature protection, and six microstep resolutions (down to 1/32-step). It operates from 8.2 – 45 V and can deliver up to approximately 1.5 A per phase without a heat sink or forced air flow (rated for up to 2.2 A per coil with sufficient additional cooling). RAMPS LCD2004 with SD Socket Related official party open source printer offline accessories. Direct support for LCD print without a computer intervention, direct support for the official open source firmware. The mechanical endstop uses a lever switch to detect when it is activated. The switch is wired up so that when activated, it pulls the signal to LOW. There is also an LED on the board that will light up when the switch is activated.It uses a standard 4 pin .100" pitch header and accepts a standard, old-style CD-ROM audio connector cable. Reprap MK2B Dual Power Supply is a Heated Bed designed for Reprap Prusa and Mendel 3D Printers and can be used with other 3D Printers too. MK2B is the latest version of the heat bed and features LEDs and 12/24V Dual power supply options. This heatbed is etched directly on 35um copper clad, and features uniform even heating and a high heat output. This is Geeetech upgraded single head MK8 extruder, which has outstanding quality and the best performance for DIY and professional systems. By simply adding a holder, you can assemble your own dual head extrusion. With 42BYGHW818 stepper motor, you will find it easy to solve the problems of uneven extrusion, regularly plugging and material reloading. E3D All Metal Hotend is designed to be used by Reprap Prusa, Mendel and other DIY 3D printers. an all Aluminium design enables this hotend to reach higher temperatures. Our hotend comes with a 0.4MM nozzle, and for 1.75MM Filaments. Designed to be used as with a Bowden Long distance Extruder, this can easily replace J-head hotend on 3D printers. Can be used straightaway with RAMPS 1.4. E3D-v6: Smaller - Easier - Higher Performance. The E3D-v6 has been redesigned from the ground up. E3D has invested a lot of time and used all of their experience to design E3D's latest and greatest HotEnd.